It came on time and looks beautiful. I absolutely love these high-quality earrings. These are so beautiful. I asked for a larger size and she did a wonderful job! Just by wearing them, I'm in a better mood. I've gotten several compliments and people are blown away that they are faux guages. They are super comfortable, they have a bit of weight because I got a larger size but still light, and I wear them a lot. Customer service was great! Shipping was fast and my items came secure and perfect to pop right into my ears! I will definitely be getting more. These are so beautiful. Just by wearing them, I'm in a better mood. I've gotten several compliments and people are blown away that they are faux guages. They are super comfortable, light and I wear them a lot. Customer service was great! Shipping was fast and my items came secure and perfect to pop right into my ears! I started making polymer clay earrings for myself back in 2009 when I realized there weren't any types of FUN gauged earrings for me to wear. Due to a large "blowout" in one of my lobes, I wasn't able to find plugs or tunnels with a large enough wearable area. When I'd seen a friend of mine with some handmade polymer clay earrings of her own creation, I realized that a whole new window of opportunity had opened before me. With all the different colors of clay, the possibilities were endless! 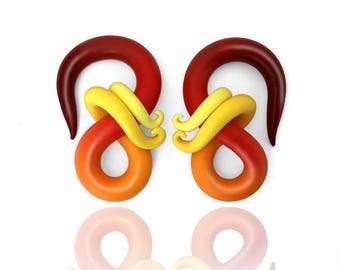 I've been making and creating polymer clay earrings for stretched lobes since 2009. My goal is to make quality pieces of jewelry that are not only beautiful but lightweight, comfortable, and long-lasting. Hello, and welcome to my shop! I specialize in customizable earrings for stretched lobes ("gauges") made from polymer clay and other wearable creations. It is extremely important to me that you are 100% satisfied with your purchase! I take the utmost care in packaging your custom jewelry to prevent damage during shipping. If your purchase arrives damaged or broken, please send me an Etsy message with a photo of your earrings, and I will gladly re-make and re-ship them - free of charge. If, in any way, you are not satisfied with your purchase, please contact me prior to leaving negative feedback so that I can make every effort to rectify the situation. Unfortunately, I cannot accept returns on custom jewelry that you have already bought and worn for sanitary reasons (unless there was an error on my part). I accept credit cards, PayPal, and Etsy gift cards. Current production time is currently 3-5 *BUSINESS* DAYS (please note that business days does not include weekends or holidays). Once your payment has cleared, your custom creation will ship within that 3-5 business day window. All items are shipped USPS First Class. Once your purchase has been shipped, you will receive an email notification from Etsy with your tracking information. Please note that the shipping price of all my items INCLUDES insurance against loss or damage. Please note that you should NEVER stretch with polymer clay! It is a porous material (like wood or bone), and should only be worn in COMPLETELY HEALED lobes. Also, to increase the life of your earrings, it is advised you DO NOT wear them while swimming, bathing/showering or sleeping.